Amb. to the UN Danny Danon, WJC, Conference of Presidents join UN to commemorate expulsion of 850,000 Jews from Arab countries. 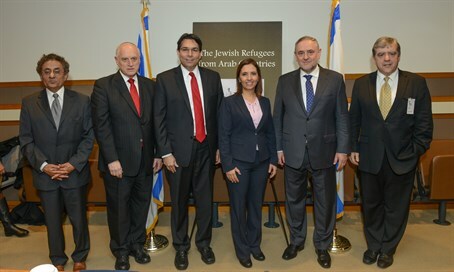 The UN commemorated the expulsion of 850,000 Jewish refugees from Arab lands on Tuesday night, in an event co-sponsored by the Permanent Mission of Israel to the UN, Ambassador Danny Danon, the World Jewish Congress (WJC) and the Conference of Presidents. Israel’s Minister for Social Equality, MK Gila Gamliel (Likud) was the guest of honor. Attendees included Jewish Community leaders and UN diplomats. Israel’s Ambassador to the UN, Danny Danon, delivered the opening remarks at the event. “We are here tonight to ensure that the world finally recognizes the stories of these forgotten refugees," Danon said. "The untold story that has been hidden for years is finally recognized. This fixes the historical injustice against Jews from Arab lands that has been going on for years." "As Israel's Ambassador I will continue to work for the proper recognition of the Jewish refugees from the Arab countries here in the UN," he added. “The history of the Jewish refugees is an almost untold chapter of the Middle East," Gamliel stated. "I stand here in the heart of the Family of Nations to declare that our story be brought to light in this institution so that at long last, justice shall finally be served." Gamliel noted the UN's infamous hypocrisy vis-a-vis Israel. The story of the ancient Jewish refugees from Arab countries was told by renowned journalists Ben Dror Yemini, whose family fled from Yemen, and David Suissa, who emigrated with his family from Morocco. "When you think about a country of 600,000 people, a very poor one and just born, to absorb that amount of Jewish refugees in 3-4 years, it is not easy," Yemini said. "Mistakes were made too, but at the end, when you look at how all that was achieved upon eventually, you will find that it is a huge achievement. We have to be proud." "We live in a world that if you want to be popular you need to look really weak and powerless," Suissa added. "In many ways, Israel is victim of its own success - because today, if you look powerful and successful, that's not how you buy yourself sympathy, and the Palestinians have figured that out: that the more powerless they look, the more they look like victims, the more sympathy they will get from the world." "So whenever we try to come across with the message that we were victims too, it doesn't resonate in a natural way with people," he continued. "That's why I think that the story of the Jewish Nakba, for me, what resonates is that this is how you deal with refugees." "The multi-cultural aspect of Israel is the ability to make millions of refugees become a source of pride for Israel." This is the third event this year that was organized by the Israeli Mission to the UN regarding Jewish refugees of Arab lands. Last week, Israeli musician Shimon Buskila performed at the UN in front of hundreds of guests, including senior diplomats, Jewish community leaders, and UN officials. “This is part of an ongoing distortion of the truth that, sadly, has become a mainstay of this international body," WJC CEO Robert Singer said. "It has always been in the interest of those who continue to deny Israel’s legitimacy to focus on Palestinian refugees and ignore the Jewish refugees, tossed out by the very same Arab states that time and again have refused to help refugees among their own." President of the Conference of Presidents, Mr. Malcolm Hoenlein, connected the event to the Syrian refugee crisis. “The refugee crisis in the Middle East today underscores the plight of the almost one million Jews who were driven from Arab countries as a result of the deliberate campaign," Hoenlein said. "It underscores the heroic effort of the fledgling government of Israel to absorb refugees equal to their existing population under dire circumstances of meager resources and war."